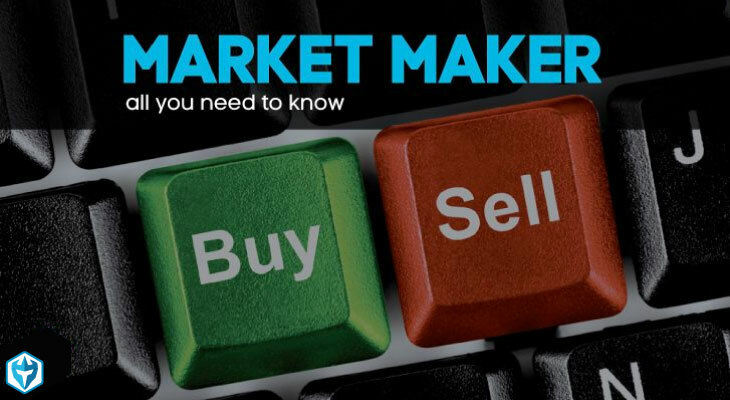 A market maker is a broker-dealer who has been certified, and/or has met capital requirements, to facilitate transactions in a particular security between the buyer and sellers. They typically hold a lot of inventory of shares in that security so they can fulfill large amounts of orders in a moments notice. Market makers compete with other market makers for order flow from other broker-dealers and in some cases will even pay for it. They make their money from the spread of the stock which can be as low as one cent, but with the amount of volume they deal with everyday, it can add up to a substantial amount of money and is why it is worth the risk of holding so much inventory. In order to become a market maker, broker-dealers are required file an application with Financial Industry Regulatory Authority (FINRA) and once they meet the financial requirements and are approved by FINRA, they can apply for the securities they would like to make a market in. Most market makers are electronic and can match orders for lightning fast execution. When you’re routing orders to different market makers it’s important to understand that you will be charged ECN fees. However, you can reduce those fees and even make a little bit of money, depending on how much size you trade, based on how you place your orders. When you place a market order or an order to buy on the ask, you are taking liquidity out of the market which will result in an ECN fee to your account. This goes for both buying and selling. If you place in order to buy on the bid or lower you are providing liquidity in the markets and if you are executed it would go as a credit to your account. So how it breaks down is if you place an order and have to wait to get it filled like with a limit order then you are providing liquidity and will receive a credit if the order gets executed. If you place an order that is automatically executed like with a market order, then you are taking liquidity out of the market and will be charged an ECN fee. They are usually sub-penny fees and credits based on how many shares you trade, but over the course of a month you can have thousands of dollars in ECN fees if you trade a lot and this can add up over the course of a year. The only downside is you have to place orders that may or may not get filled in order to receive the credit.